This stylish light therapy lamp offers the same mood and concentration benefits as not-as-cool ones do. Style-wise, this therapy lamp is light-years beyond its bulky, clinical-looking cousins, yet it provides the same benefits. 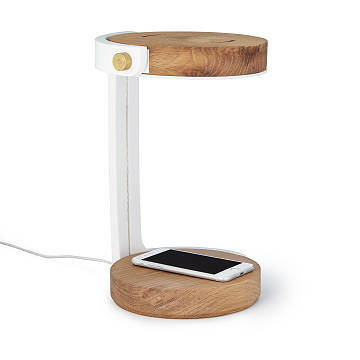 The dimmer-controlled bright white LED helps boost mood and concentration, and its modern design and warm oak wood add happy-making style to your desk. If we were scientists, we might explain circadian rhythms here. We're just design geeks, but we figure, to minimize SAD (Seasonal Affective Disorder), it can't hurt to avoid drab, right? Made in Vancouver, Canada. Provides the equivalent of 10,000 Lux at 20 inches from the user. Approximate peak at 465nm. UV Free.